Oh I so agree with you about most restaurant salads – this beats them hands down! YES! this looks so delicious (and is really beautiful, too). 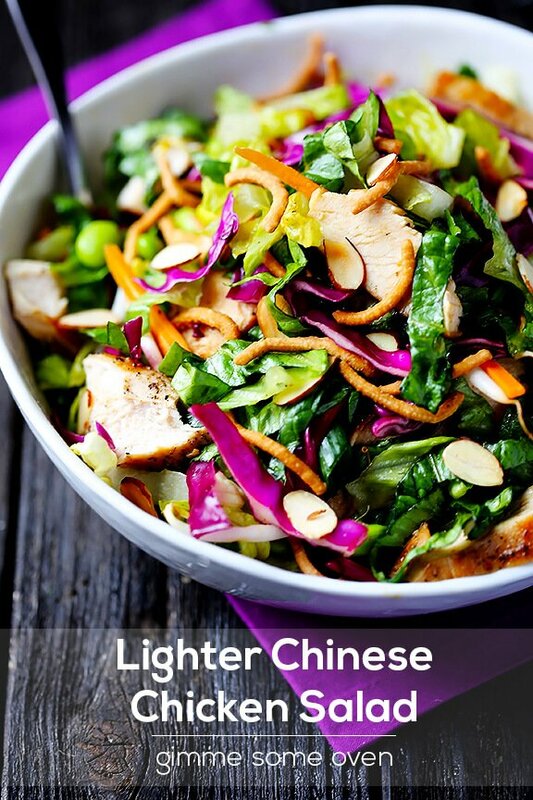 I love applebee’s chinese chicken salad, but it is WAY too unhealthy — this looks like a fabulous alternative! 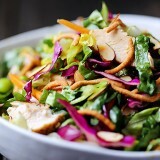 I love Chinese Chicken Salad and this looks fabulous! 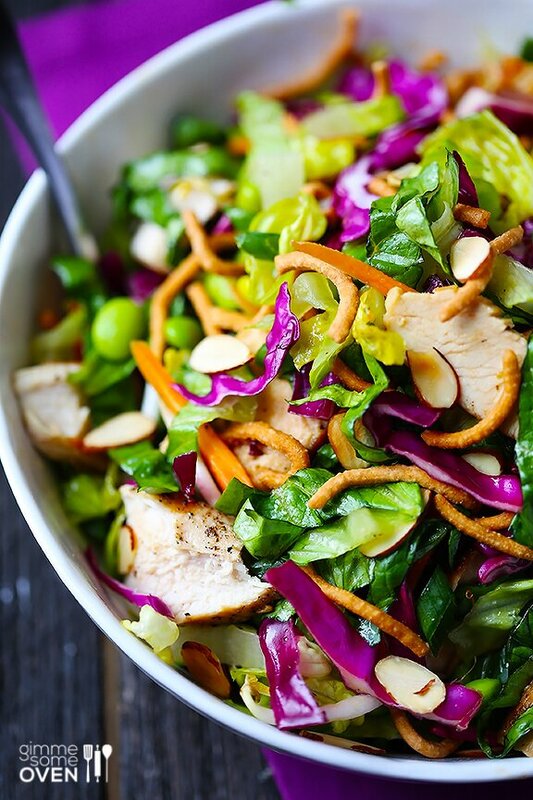 Love the sesame-ginger vinaigrette! Yum! Aren’t those segments hilarious? This looks to die for!! I make a similar version with rotisserie chicken and lots of fresh Thai basil. 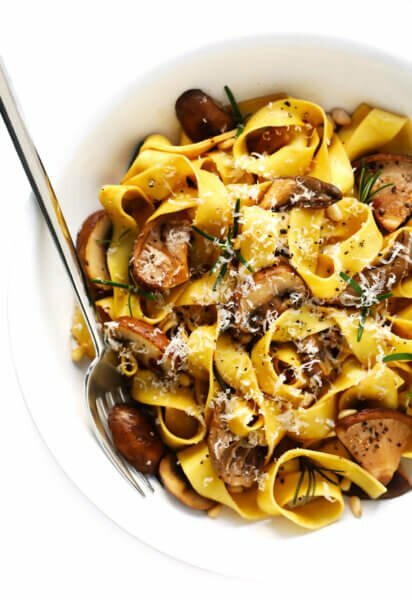 It’s usually my Summer lunch staple – so addictive! Love that you added edamame!! Salads are so easy to go overboard with, and I think I know the one you mean and it’s delicious! Yours looks fantastic, too. The bright colors make it so pretty and I find I really love making my own dressings. I’ll have to try this one! I love this salad! Chinese food is my favorite and I always love a slimmed doen version! I have had this exact same experience Ali! It’s like, why didn’t I just opt for the double bacon burger with a side of baby back ribs? Your healthy version is so gorgeous, I will *almost* feel bad taking a bite. Key word: almost. I just about fell out of my chair this morning when I saw you’d commented on my blog. I’ve been reading yours for ages and LOVE it! Thanks for your sweet comment. This looks INCREDIBLE. Can’t wait to try the dressing! I love everything about this. I’m always so disappointed to learn how bad restaurant salads are for you…they are supposed to be healthy! Ali your photos are always so vibrant and gorgeous! This salad is begging to be made! LOVE IT! Oh, I totally know.. some of my favorites salads are way more calories than a cheeseburger and fries…sigh. This one though, pretty sure this might be my new fave. My word. 98 grams of fat in a salad. I have some favorite chicken strips that clock in at around 2k calories. Ridiculous! Sooooo, I think I’ll just go ahead and eat this salad. The flavors sound amazing! I always mourn a little bit when I find out one of my favorite restaurant foods is ridiculously terrible for me. :( But I love that you can make a lighter yet delicious version of this salad at home — it’s so bright and beautiful! I’m pretty sure I wouldn’t miss those extra fat grams with this!! Oh wow! This looks amazing…So fresh and healthy – want some of this really soon!!! Best looking salad EVER! I cannot believe the 98 grams of fat!! YIKES! Definitely will be trying your salad soon! Grrrrrrr……I hate when that happens! Seriously, so annoying! Why can’t they just make a “normal” salad? Maybe you should give them your recipe because this salad looks amazing! Oh i Love this Ali!!! You’re so right about salads being so bad for you when you eat out. The dressing is normally the worst part, so if the dressing isn’t on the side, forget it! I’m a big salad person, and this one has everything I love in it — nice, fresh ingredients, loads of color, and crunch. Thanks for another great light recipe! 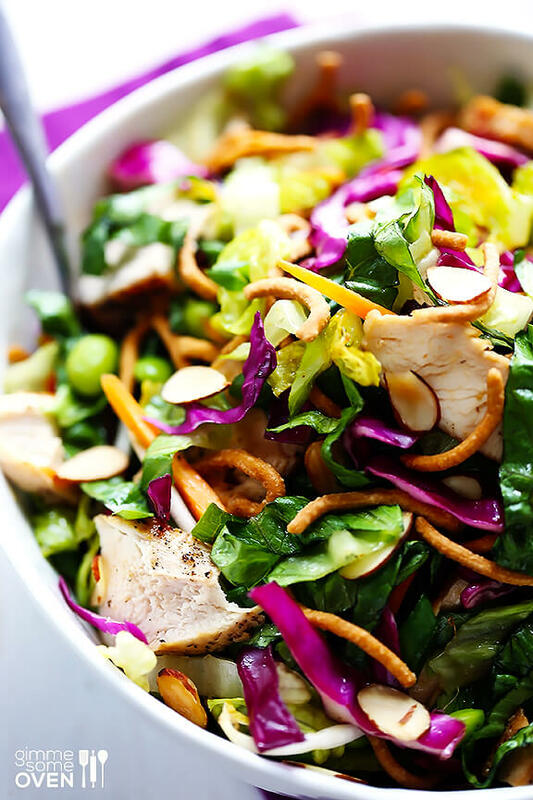 This is one of my fave salads, your version looks fab! Ali this salad looks fantastic! And that’s saying something because I’m not usually drooling over salads ;) With all this lovely warm weather this would be an awesome light lunch option! Restaurant food kind of scares me which is good since I love cooking at home. Love this salad Ali! I am SO on this Ali. Gosh knows I need a healthy salad in my life these days. And I, too, looked up the nutrition facts of my favorite innocent sounding peanut thai chicken salad – 61 grams of fat. WHAT the heck (!!!!). Not as bad as yours, but still – so shocking. Wow! 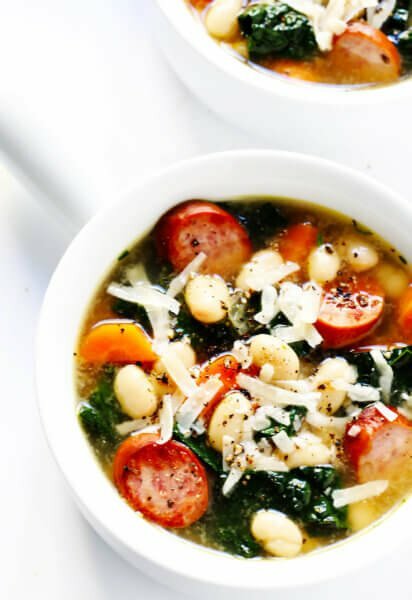 This looks so delicious and I love how colorful and easy it is, too! Great recipe, Ali. Thanks for sharing! Such beautiful photos!! This salad looks amazing..
There’s nothing worse than thinking you’re being healthy ordering a salad and then finding out it’s anything but! This one looks beautiful, healthy, AND delicious! Wow! The colors of this salad make me feel healthy! Gorgeous! wow, Ali, this salad is GORGEOUS. the colors are so vivid and bright and vibrant! you make me want to devour my entire screen so i can have this salad! i love that you made it light too :) perfecto! Absolutely gorgeous salad. Love all the vegetable colors and it doesn’t hurt that its healthier for you. So beautiful, and I love the purple accent! Can’t wait to try this one. It’s so disgusting just how fattening salads can be. At some restaurants, you would be better off with the burger! I love this light salad you have created here! And I love how vibrant the photos are! Love this salad!! I’ve been trying to eat more veggies, this is the perfect way to get some in, along with protein. The dressing sounds fab! 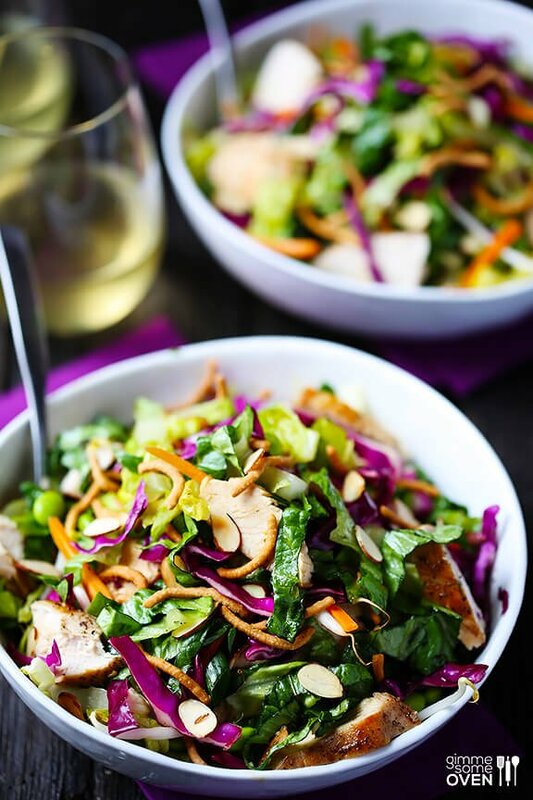 Oh, I know i know, but sometimes food in restaurants is tempting, especially when I’m tired and don’t feel like doing anything but drinking my wine while waiting for food :) I like addition of noodles to your salad, it must compose well in all vegetables and chicken. Thank you for this recipe!! I love this kind of salad and I ususally do get it at Applebee’s, but now I am really excited to try yours!! What a stunning salad! I usually get this at the cafeteria at my work but I definitely need to try this version! I’ll be saving so much money and I’m sure it would taste 10000000x better! I’d much rather eat the homemade version anyway! Beautiful! I love how fresh and vibrant this is – and the dressing sounds awesome! This salad is absolutely gorgeous :) it looks so fresh and crunchy. I can just imagine how wonderful it must taste! Such a bright and fresh salad, Ali. 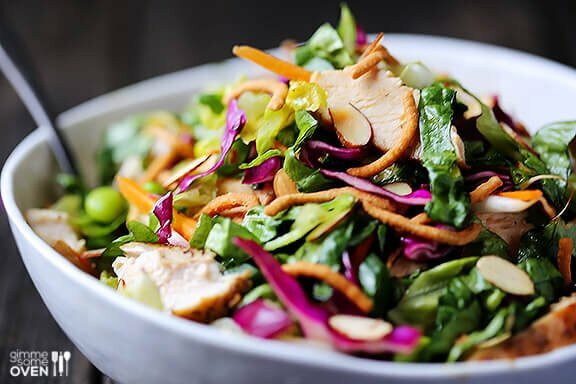 I remember in high school Chinese chicken salad was all the rage, everyone had to order it when we would go hit up the local food place and sit around with our backpacks in a booth, the unnecessarily heavy version, of course. I love how you remade it. 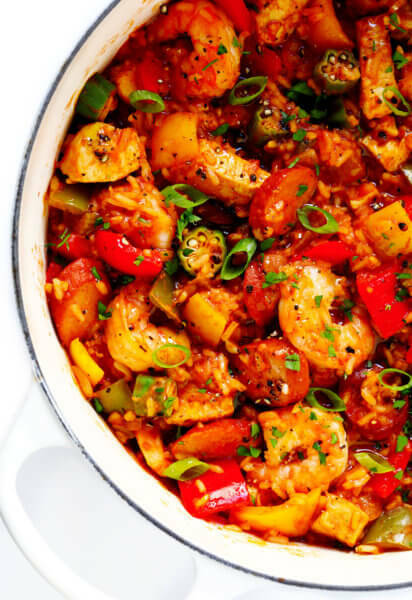 I just made this for dinner tonight and it was delicious!! The dressing was spot-on. I used a whole small bag of edamame to increase the protein, since I made my portion vegetarian. Didn’t have chow mein noodles, so I crumbled some dry Top Ramen noodles instead and it added the perfect crunch. I served the dressing on the side, so the salad ingredients will stay fresh. I’m going to pack it up in tall Mason jars to take for lunch all week! This looks so pretty! Love the purple cabbage :) I’m going to make this for sure…I think it would be great to bring to a party :) Thanks for posting this!